(Bloomberg) -- Amazon.com Inc. Chief Executive Officer Jeff Bezos will retain 75 percent of his stock in the company following his divorce from MacKenzie Bezos, the couple announced Thursday on Twitter, eliminating any concern that the split would influence his control over one of the world’s most valuable businesses. 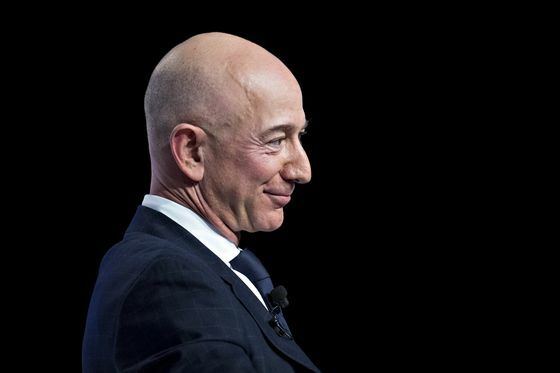 Bezos will continue to be the largest shareholder of the e-commerce giant valued at almost $900 billion as well as gain voting control of his former wife’s remaining shares. Bezos will also maintain ownership of the Washington Post and his space exploration company, Blue Origin LLC. Amazon investors mostly shrugged off news in January of the couple’s divorce after 25 years of marriage. The statement Thursday confirms the company faces few complications, said RJ Hottovy, an analyst at Morningstar Inc.
MacKenzie Bezos retains 4 percent of Amazon, or about 19.7 million shares worth about $35.7 billion, the company said in a filing, making her the world’s fourth-richest woman, according to data compiled by Bloomberg. Amazon shares dipped less than 1 percent at 1:38 p.m. in New York. Bezos remains embroiled in a public relations feud with the National Enquirer and its parent company, American Media Inc., about how the company learned of his extramarital affair and obtained graphic photos he sent his lover. The tabloid said it learned of the affair from Michael Sanchez, the brother of Bezos’s girlfriend. Bezos security consultant Gavin De Becker last week accused Saudi Arabia of accessing the billionaire’s phone data. MacKenzie, an author, played a significant role at the company in the early years, but her presence faded in later years. Most high-ranking employees saw her at social events the couple hosted at their Medina, Washington, home and elsewhere. They’d also be spotted at Lakeside, a Seattle private school, with their children. When Amazon showcased its new biospheres, the plant-filled architectural centerpiece of its Seattle headquarters, the couple toured the building with a horticulturist. MacKenzie also accompanied her husband to Hollywood events after Amazon began a concerted push into video and original programming.